Some call it the #And1SelfieLeague. Some call it the #SelfieOlympics. Everybody calls it hilarious. This is one of the earliest inspiring extreme selfies, if not the one that inspired it all. Twitter has since exploded with extreme selfies. Here are some of the best of the best, scored by difficulty, creativity, and LOL factor. SCORE: 7.5. Points added for the mouthwash on the sink because dental hygiene is important. 2. The "Check Out My Socks"
SCORE: 9. Half point added for the socks because those are really nice. SCORE: 9.5. Half a point added for boldness in mixing stripes and plaid. 5. The "When Your Whole Outfit Is On Point"
SCORE: 8. No frills, just the 'fit. SCORE: 5 for the iPad in the hand, 8 for the iPhone in the foot. SCORE: 7. Additional points possible if the rhyme he spit was hot. SCORE: 9. To the internet, and beyond! 10. The "I'm Gonna Need Those TPS Reports"
SCORE: 8.5. Hope he uses the right cover sheet, that would be greeeeeat. SCORE: 8.5. Selfie game, that's all them. All them, for real. 12. The "Fish Don't Fry In The Kitchen"
SCORE: 9.5. SUPER impressive, but it's not technically a selfie since he didn't take it himself. Or did he? What the hell, make it a 10. 14. The "Whole New World"
SCORE: 10. Selfie, shimmering, splendid. 15. The "Student Of The Month"
SCORE: 8.5. Minus a point for reminding the teacher that she forgot to assign homework. 16. The "Walks On Water"
SCORE: 10. Too scared to give Jesus anything less than a 10. 17. The "Rover Caught Me Slippin'"
SCORE: 10. Pet selfies always get 10s. SCORE: 9. Crisp, clean lines. Weeeerk. SCORE: 8.5. Strong toe point. Good form. 20. The "Screw you, Hercules"
21. The "I'm Not About To Wash No Dishes, Man"
SCORE: 9. Points added for resourcefulness. 22. The "Back in MY Day..."
SCORE: 10 for difficulty -- he had to walk 73 miles in the snow, both ways, with NO SHOES ON to get that telephone. 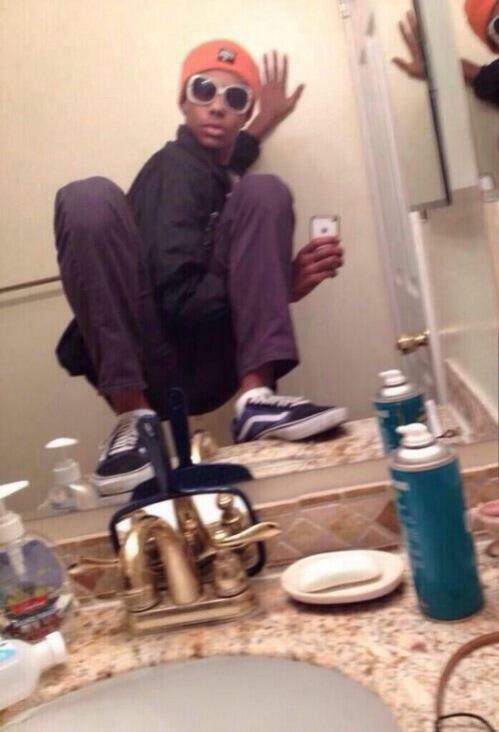 For more hilarious selfies, check out the tags #SelfieOlympics and #And1SelfieLeague on Twitter!